In a bit of fun and recognition for outstanding leadership D.G. 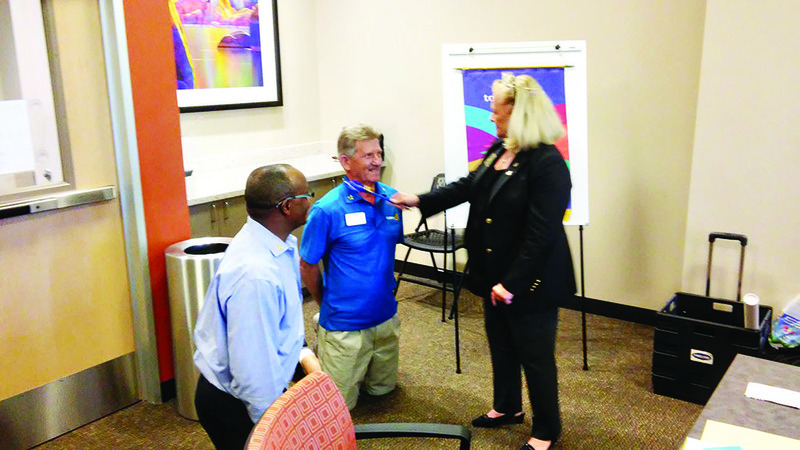 Sherry is seen knighting Sir Terry Lubsen and current club President Dan Albertson. On October 8, the San Tan Crown Rotary Club greeted District Governor Sherry Mischel who presented Terry Lubsen with his Paul Harris Award (third Level). Terry is a past President of the club and past Assistant District Governor. The San Tan Crown Rotary Club serves the needs of active and retired veterans in our community as well as supporting homeless children and those in transition in Chandler, AZ. For more information on how you can become acquainted with the work we do, how you can volunteer to help on some of our projects, or how you can become a member of our fun group of members, please consider visiting our website at www.santancrownrotaryclub.com. You may also call our Membership Chair James Kame, at 480-593-4507.